A recent study published in the Annals of Surgical Oncology highlighted a promising treatment that could possibly extend the life expectancy for patients suffering from malignant peritoneal mesothelioma. According to the report, a large portion of patients in a studying undergoing two-stage cytoreduction and intraperitoneal chemotherapy regimen had a significantly longer lifespan thanks to the treatment. The treatment worked by first putting the patient through cytoreductive surgery, a procedure that removes tumors from inside the abdominal wall of mesothelioma patients. After undergoing surgery, doctors treated the patients with intraperitoneal chemotherapy to help kill any mesothelioma tumors possible left over from the surgery. Doctors then monitored patients with CT scans of the abdomen, chest, and pelvis every six months for signs of tumor growth. Patients with tumors received a second round of cytoreduction and intraperitoneal chemotherapy while those without tumors only received the chemotherapy portion of the treatment. The average patient survival rate after undergoing the treatment was 6.65 years and 30% of the 113 patients at New York-Presbyterian Hospital/Columbia University Medical Center lived at least another 10 years. 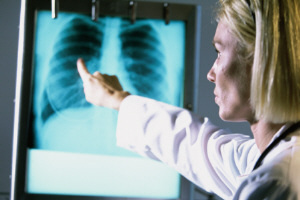 The study is good news for mesothelioma patients fighting mesothelioma of the abdomen, known as peritoneal mesothelioma. Researchers found that whether the patient needed a second round of cytoreduction surgery or just the intraperitoneal chemotherapy, both groups had better than expected life expectancies following the surgery. The outcome is a testament to both the promise of the study and the skill of the physicians and researchers applying the techniques to the patients. Unlike pleural mesothelioma patients whose disease grows more rapidly in their lungs, peritoneal mesothelioma generally benefit from slower tumor growth in the abdominal cavity. While there is still no cure for mesothelioma, researchers and physicians continue to try and make progress to hopefully wipe out the disease once and for all. In addition to two-state surgery/chemotherapy treatments showing promise, several recent studies utilizing immunotherapy could potentially lead to huge breakthroughs for mesothelioma cancer patients. Immunotherapy works by training the body’s own immune system to recognize and seek out mesothelioma tumors without the need for debilitating radiation and chemotherapy treatments that can harm the body’s own cells. These treatments can often be expensive and patients do not always have the financial resources to pay for them. Fortunately, the law gives asbestos cancer victims the right to hold the asbestos companies responsible for the diagnosis by filing asbestos cancer lawsuits to recover compensation to pay for medical bills and recover lost wages following exposure to toxic asbestos contaminated products.